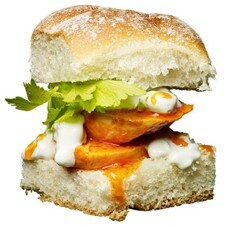 Perfect Kid-Sized Buffalo Chicken Sliders- An easy dinner for tonight! 1. Cut 12 uncooked chicken tenders (about 2 pounds) in half crosswise. Sprinkle with 1 teaspoon paprika.Grill on stovetop- 4 minutes per side, turning once, or until cooked through. 2. Heat 2 tablespoons chicken broth with 2 tablespoons butter. Stir in 1/4 cup Frank’s Red Hot Wings sauce. 3. Place chicken in large bowl and toss with sauce. Serve with celery and dip. 4. Make the dip by combining 1/2 cup of 2% Greek yogurt and 1/2 cup light blue-cheese dressing.